WAREHAM, Mass. — The Tobey Hospital Guild recently announced $3,000 in scholarship awards for Greater Wareham students who are pursuing a career in healthcare. 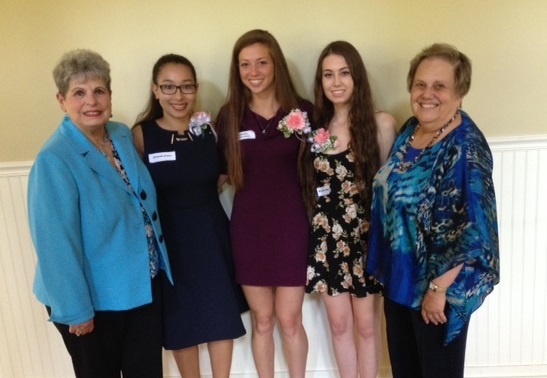 The Guild presented a $1,000 scholarship to three outgoing high school seniors during its annual Scholarship Luncheon held May 28 at Bay Pointe Country Club in Buzzards Bay. The awards were presented by Josephine Praino, Scholarship Chair for the Tobey Hospital Guild. Victoria Dallacosta, a graduate of Upper Cape Cod Regional Technical High School, will be entering the American International College in Springfield, Mass., to become an occupational therapist. Zariah Lima, a graduate of Wareham High School, will be attending Wheelock College in Boston, Mass., to begin her studies in psychology and human development. Zariah received the Jean I. MacDonald Scholarship, which was created in Jean’s memory by her husband, Walter, and family. Jean, who was the president of the Tobey Guild from 2001 to 2003, recently passed away. Heather Staples, a graduate of Old Colony Regional Vocational Technical High School, will be entering the nursing program at the University of Massachusetts Dartmouth. Heather received the Leonard Martone Scholarship created by his wife, Elizabeth, in his loving memory. The Tobey Hospital Guild is a non-profit organization whose purpose is to render service to Tobey Hospital, its not-for-profit subsidiaries, its patients and to assist in promoting the health and welfare of the community. The Guild raises money throughout the year by hosting various fundraisers, and also runs the hospital gift shop with all proceeds going to Tobey Hospital. Joining the Guild is a great way to become involved in your community hospital. Members serve as ambassadors to the community on behalf of the hospital. For more information or to join, please contact Sandy, Membership Chair, at 508-748-0794.